I told you guys a few days ago that I wore the same outfit 4 out of 7 days, which means I don’t have as many outfits to show. So instead here’s a recap of my recent purchases. Uh, was I looking for print or what? In my Feb/March purchases I said I didn’t really shop in Feb but went crazy in March. I noticed a pattern this time as well in how I made maybe 1-2 purchases in April and a ton in May. Tracking back to Feb/March, I ended up returning 4 of the items. Also, reflecting on Feb/March purchases made me recognize that I needed to wear those pieces more. I still love the ones I kept, but I felt like I was wearing them often. However I realize that reality says I didn’t wear them as often as I thought which helps me feel like I can break them out more! 1. Snakeskin blouse (shop). I really like this thing, as indicated in my post about it. It easily transitions from casual to business, and I could see it being dressed up to go out too. 2 & 3. Printed sleeveless tops (not online, but in-store next to these tops). I already told you how much I love these in this post and this post. Gahhhh I’m so happy I found printed sleeveless tops! 4. Floral skirt (shop exact, similar). UHHHH okay, I freaking fracking love this skirt. I will tell you more about the shop it came from in another post because I also love love love that store. Heads up, there will also be a free shipping code provided for you guys in the future post! EDIT: use code PMTFreeShip for free shipping! 5. Printed skirt (shop). Not sure if I’m gonna keep this yet. I like it, but I’m wondering if the floral skirt would overshadow it and fill the same space in my closet. Thoughts? 7. Denim jacket (shop). I have one from Forever 21 that is like 10 years old. It’s still in good shape, but I wanted a lighter wash than the one I have. It’s a subtle difference but it has seemed to make huge improvements in my outfits, so I’m happy with that decision. 8. Sandals (shop). I have a similar pair of metallic sandals, but like with the denim jacket above the difference between cognac and metallic is subtle but has also made big improvements in how I feel about my outfits. Thanks to birthday gift money, selling my clothes in Storenvy, and Chinese New Year money I felt very okay spending the $15 to get another pair of sandals. 9. 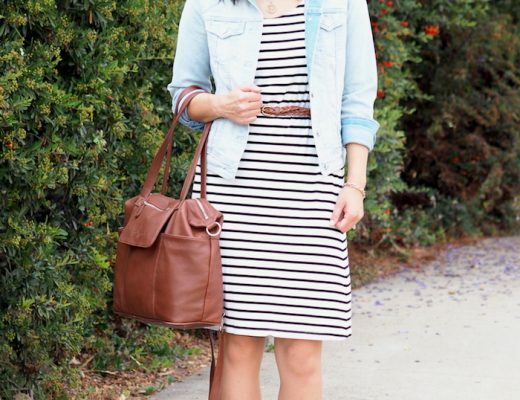 Striped dress (shop). After much searching, I finally found a striped dress! I was sad when I had o return the striped dress I showed in March, but this one works much better for what I want it to do. 10. Ikat maxi (shop). This was a birthday gift from my husband–something I totally wanted and knew I could make great use of but couldn’t swallow the price tag for. I wore it once for my birthday party and cannot wait to wear it again! Realistically, I want to hem it first before wearing it again though. I had to wear wedges with it and I’d prefer to be able to wear sandals with it. I don’t think I have a favorite purchase. 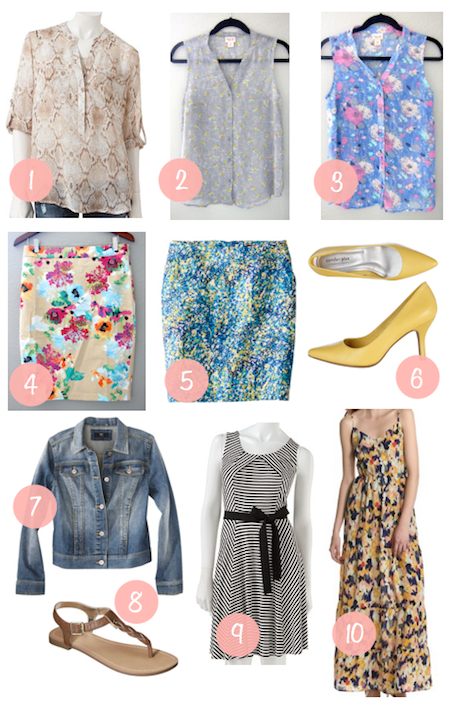 There are so many fun prints here that they all make me happy! What have your own favorite purchases lately? My opinion about the skirts is that they are similar enough that I wouldn't need to own both. Maybe if I wore skirts more often (and I didn't live in a cooler climate). I love the triangle top from Target, that I bought this month – and some Sam & Libby metallic sandals – I do get my money's worth out of sandals! Love your blog, and all the ideas for affordable clothing/outfits it gives me! I love the blue and yellow skirt – and you have a number of yellow accessories that would look great with it! I would keep it! Oooh nice! I've totally been planning to pair it with white bottoms. I imagine it was a fresh look with your shorts and espadrilles! I love that you got compliments too! I bought a cute pair of fairly bright orange shorts with white polka dots at Maurice's. But I have no idea what to wear the with. Any suggestions?! No kidding, I JUST got #4 last week in the mail, and I also LOVE it! I don't wear skirts often, but I had to have this one. So…if it were me, I'd probably return the blue skirt just because I have to kind of push myself to wear skirts in general. Love your blog and your fresh perspective! I love wearing a Denim Jacket in the summer. I've had my one for 10 years so am looking for a new one! I bought two of the Target printed sleeveless tops after you posted about them and I LOVE them. Perfect for both my causal and work wardrobe. Thanks! #2 and #5 are ADORABLE! I think I need to get a maxi dress, too. But I'm pretty tall and I always feel too tall when wearing a maxi skirt or dress. Do you think it makes you look taller visually or is it me? I wear skirts constantly in spring and summer, and would keep both. They will each be versatile, and are different enough so you won't look like you're wearing same thing. Then again, I live in skirts come summer so I like having lots. For the floral skirt from conversation pieces what size did you get? I usually wear a 6 so not sure maybe thats the large? is it pretty stretchy? thanks! I really like the #4 skirt. It looks a lot like a top I bought from Target a few months ago. I am usually a 6/8 on the bottom and I got large. It's very stretchy, but I went by the measurements listed for the skirt and the 38" hips on the large for me was spot on. The skirt fits perfectly without looking like it's stretched awkward, which probably would have happened if I had gotten the medium. Use the code PMTFreeShip for free shipping! Also, I'm posting an outfit with that skirt tomorrow. So excited! I love 5 and think you should totally keep it. It would look super cute with a tucked in shirt and pretty cardigan! Love the snake skin top and the floral skirts! You can never have too many printed pencil skirts! And as someone who owns both the navy polka dot and the blue scroll pattern, I can most assuredly vouch for the quality of these skirts. Now that you've showcased the blue and yellow, I may just pop on over to Target and complete my collection. LOL! I am always searching for a good printed pencil skirt, but so far I haven't found one I really love. And that maxi dress is lovely, I remember it from you birthday post. Being barely 5'2", it's hard for me to find maxis that are versatile. You did a great job sticking with things you'd been looking for! The top of my purchase list keeps changing every month! Right now I'm semi-obsessed with having a utility jacket. I'm having absolutely no luck in stores and online is so hard because they only end up working half the time. As for the skirt you haven't decided on, I'm not a huge fan of the print but with all the colors, you can definitely get a lot of use out of it. You have lots of blue, green, and yellow you could pair with it! I really like that you do this. I started doing the same thing each month to visualize and see everything I bought for the month. How do you get your collages to look so nice and add those little numbers? I've been using a website but it automatically crops the pictures which ends up cutting them off at parts. Oh my goodness those skirts are amazing! I just realized I need more printed pencil skirts in my life. DUDE, I didn't know you were blogging again! I'm so happy! LOVE these! I've always been a plain-jane girl & recently (mostly after finding your blog) realized that instead of layering (read: being hot & sweaty all the time) for interest, I really need to add pattern. so i went shopping today after reading this post yesterday. and i'm really have trouble finding prints that don't feel "old lady" ish without being too bold. i love stripes & polka dots–but when i wear them at work, i feel like a 14 year old sometimes. any print-finding tips? any tips? or even better, any LINKS?! I'm glad you admitted to wearing the same thing multiple times – I do too, and I think people think you should wear something new/different every day, especially if you're a blogger. If you own things you love that are good quality, why not wear them all the time, right? Love love love all your purchases, especially the Conversation Pieces skirt and the striped Kohls dress! 🙂 Can't wait to see you wear all of them! holy patterns lady! that's the great thing when you already have the basics like you do – you can add those patterned items and you automatically have like 15 different outfits. Can't wait to see them in future outfit posts! I went out and got that snakeskin blouse after I saw your post about it and I love it!! Haha! I did the same thing! It's a new favorite.